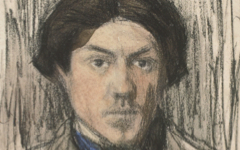 Almost any figure can represent the artist. In this 1905 painting by Picasso a boy in blue overalls sits facing us, holding a pipe the wrong way round. He is crowned with a wreath of roses. 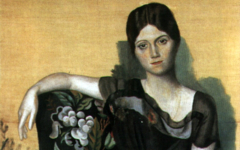 André Salmon, a friend of Picasso, wrote about this painting in 1912. 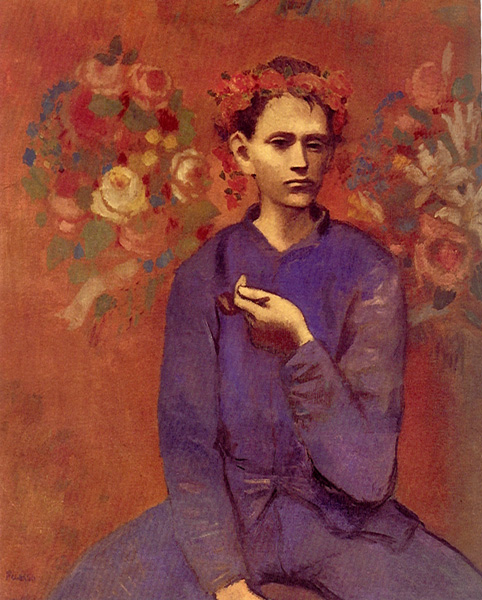 He described how ‘Picasso had painted without a model the very pure and simple image of a young Parisian worker, beardless and dressed in blue denim - just about the appearance of the artist himself during working hours.’1Not only does the youth wear Picasso’s studio uniform but he is crowned with a wreath as great poets were crowned in antiquity. As in so many other masterpieces discussed on this site, the two realities – that of the painting and of the studio – have been fused. The boy is a reflection of Picasso. 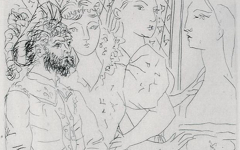 See explanations of other works by Pablo Picasso. Original Publication Date on EPPH: 07 Apr 2011. © Simon Abrahams. Articles on this site are the copyright of Simon Abrahams. To use copyrighted material in print or other media for purposes beyond 'fair use', you must obtain permission from the copyright owner. Websites may link to this page without permission (please do) but may not reproduce the material on their own site without crediting Simon Abrahams and EPPH.